This article is a companion piece to the Growing of Persimmons, published on the Monterey Chapter of the California Rare Fruit Growers blog here. When I was a child growing up in Indiana, every year I looked forward to an amazing seasonal treat called persimmon pudding. It was more of a bread than a pudding, similar to banana bread with a thick moist texture, packed with spices, and often topped with homemade whipped cream. I loved that desert fiendishly, though I had no idea what a persimmon was. As an adult, I moved to California, and began to encounter the persimmons here in tree form, with their perfect orange globes hanging like perfect ornaments from bare trees in the late Fall. Only then did I connect the treat of my childhood with the iconic fruit trees growing in my new home. Both American native persimmons and the Asian imports grown across California belong to the genus Diospyros which roughly translates as the Fruit of the Gods in Greek. The American species, formally known as Diopyros Virginiana, grows wild across the southeastern part of the country, ranging from southern Connecticut and Long Island to Florida, then west to Texas, Louisiana, Oklahoma, Kansas, and Iowa. These trees grow tall, up to 60 feet, and produce abundant yet small astringent fruit in the late Fall. The more domesticated species of persimmon, Diospyros Kaki, has been grown in Asia for millennia and is what is most often encountered at markets and in yards in California. There are dozens of varieties of persimmons grown commercially, but the most common two by far are Fuyu and Hachiya. Fuyu is a non-astringent persimmon, shaped like a flattened peach. Non-astringent means it is edible when hard or soft, and can be eaten like an apple, cut up into salads, and turned into any kind of jam, butter or jelly. Other non-astringent varieties grown commercially include Izu and Jiro. Hachiya persimmons are shaped like big acorns, and most important to remember, are astringent, which means they are awful when hard - sour and bitter to the extreme. Many people make the grievous error of biting into a hard Hachiya persimmon, and swear never to eat one again, which is a minor tragedy. When Hachiyas are left to ripen to the texture of pudding or jam, however, their flavor is divine. My favorite astringent persimmon, however, is the Saijo which I am told means in Japanese “the very best one,” and it certainly lives up to it’s name. They are smaller and not as pretty as Hachiya, but the flavor is phenomenal, deep and spicy. Persimmons are nutrient and fiber powerhouses. As their brilliant orange skin and flesh suggests, they are packed with vitamins, minerals and anti-oxidants. If you’d like to learn more, read the fine print below. Persimmons are a very good source of dietary fiber. 100 g of fresh fruit holds 3.6 g or 9.5% of recommended daily intake of soluble and insoluble fiber. Zeaxanthin, an important dietary carotenoid, is selectively absorbed into the retinal macula lutea in the eyes where it thought to provide antioxidant and protective light-filtering functions. It, thus, helps prevent "Age-related macular related macular disease"(ARMD) in the elderly. Most persimmons when hard will last in the fridge for up to a month. To eat a hacihiya or any other variety of astringent persimmon, set them on the countertop with the bottom facing up. Give them a little squeeze everyday, and when they feel completely softened, they are ready for fresh eating or adding to salads and other recipes. Unfortunately, astringent persimmons pass through their perfectly ripe phase quite quickly, so monitor them carefully. 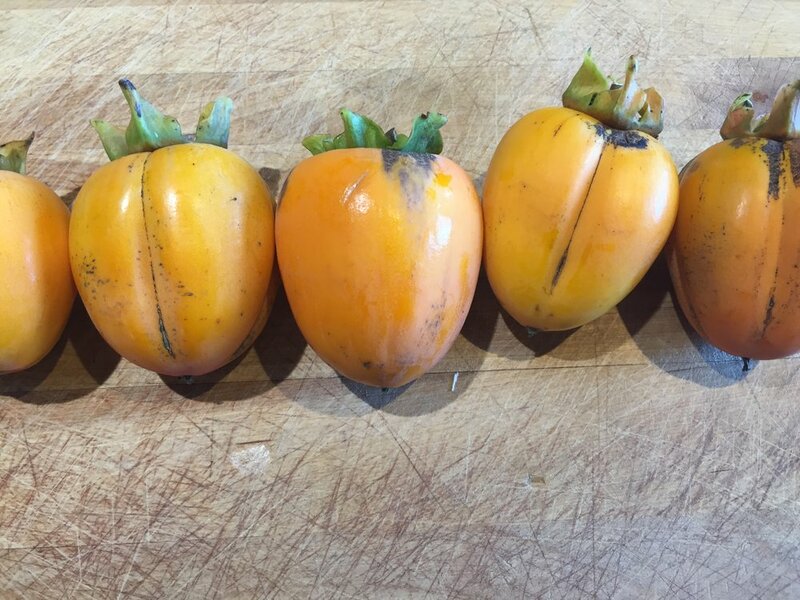 Hachiya Persimmons - the two on either end are still hard but the middle one is soft and ripe, note the translucent and deeper colored skin. Fuyu and other non-astringent persimmons can be eaten when hard, as long as they have ripened to a uniformly orange color with little or no green left on the skin. I like to let them sit around for a few days for the flavor to mellow, and then skin to give a little bit for optimal flavor. Astringent persimmons respond really well to drying, and considering their very brief window of ripeness, this is often the best way to eat them. The simplest way to dry persimmons is to slice fruits thinly and put them in a dehydrator or oven at around 120-130 degrees F until they develop a chewy but not crispy texture, usually around 10-15 hours depending on how thinly they have been sliced. Drying persimmons removes the astringency, but sometimes not entirely. An old Japanese method for drying persimmons is called Hoshigaki. This techniqu involves peeling the hard persimmons, hanging them to dry, and then hand massaging them every day for up to a month, until they develop an amazing texture and flavor. Hoshigaki has been called the Kobe beef of dried fruit. These are my favorite persimmon recipes I have found online. If you have any favorites you care to share, please add them to the comments below! It’s been quite a year. After 5 years on this property, planting trees and building a farm in the slowest of possible ways, we finally had a real harvest, and it was a great one! It’s hard to believe that the thin and spindly twigs of bare-root trees that are delivered in the dead of winter, then gently placed into the ground, will someday grow into healthy trees covered in fruit. And yet, so it is, and of the 600 or so trees we have planted, most are now thriving, and perhaps half fruited this year, most for the first time. I am so grateful to everyone who believed in our crazy mission to grow a diverse fruit orchard on these bare acres 62 months ago. Thank you thank you thank you all. Now that the madness of the summer is over, finally we have had the time to reboot our website! So welcome, and let us know what you think! Fall is not entirely without it’s farm chores, the most enjoyable being the apple, pear, fig and persimmon harvest to come. We are also deep in the midst of planning for the year to come. Approximately 100 trees to plant this winter have been ordered, with a focus on new apple and pear varieties as well as pluots and nectarines. Since cut flowers did so well this summer, we are also planning to expand into cool weather annuals such as delphiniums, sweet peas, stock and and snapdragons. More perennial flowers are also on their way, including additional dahlias, roses, peonies, and hydrangea.